Barack Obama at Harvard Law School anticipated dangers to rights of pregnant women. Barack Obama as a student at Harvard university, circa 1992. 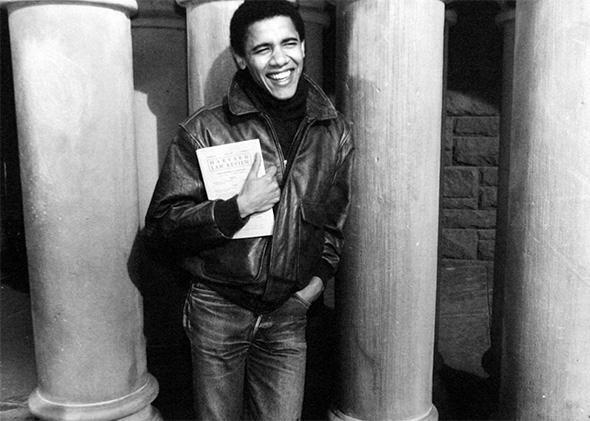 As a college senior, Barack Obama wrote love letters to his girlfriend that doubled as astute literary criticism of T.S. Eliot’s The Waste Land. This fact, considered in a January post at the New York Review of Books, affirmed the 44th president’s status as the nation’s most eminently intellectual, cool, and crush-worthy POTUS. Now, a revelation about his Harvard Law School days once again confirms that point. Unfortunately, policymakers of the 1990s and 2000s did not follow the advice of this levelheaded young law student. Instead, in the late ’90s, anti-abortion lobbyists used the enduring—and scientifically inaccurate—fear of developmentally stunted “crack babies” as an excuse to pass laws that gave the fetuses of pregnant drug users their own civil rights. Since 2007, the National Right to Life Committee has looked at “feticide” laws as a way to “change the hearts and minds of the public on abortion,” and has pushed “fetal personhood” measures at the state level with increasing success. Last spring, an Indiana woman named Purvi Patel became the first person in U.S. history to be charged, convicted, and sentenced for “feticide” after aborting her own pregnancy; the group National Advocates for Pregnant Women has documented hundreds of other cases where women were arrested or detained for infringing on the rights of their fetuses. Meanwhile, Tennessee is the first state to have passed a law under which women who use drugs during pregnancy can be charged with criminal assault. The American Prospect has reported that others may not be far behind. As Deborah Tuerkheimer, a law professor at Northwestern University, has told me, fetal personhood laws render women “invisible. It’s all about the baby inside of her, and she is the vessel for that creature.” A young Obama may have been one of the first people to recognize how easily our legal code could be twisted to reflect that idea. Twenty-six years later, his suggestions for alternative policies are worth a reread.